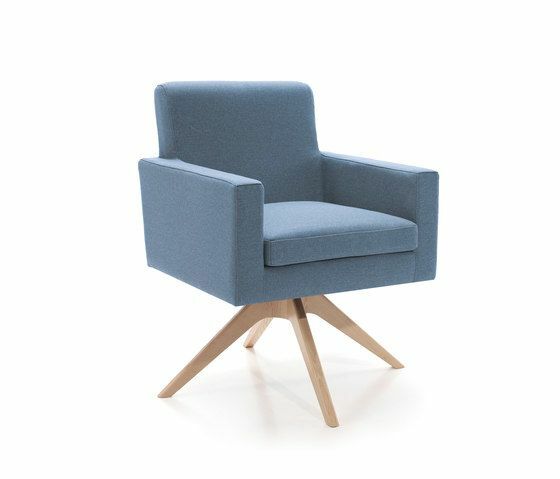 Armchair in a contemporary style, with compact shapes that allows us to place it in any environment. The swivel base brings elegance and lightness. Removable upholstery is optional. MATERIALS: – Solid wood frame, covered by HRD 30 kg/m3 foam. Suspension made with elastic Nea webbing, guarantee of quality 10 years. – Seat cushion in HR 35 kg/m3 foam covered in thermo-sealed H250gr fibre. – Back cushion in HR 30kg/m3 foam covered in thermo-sealed H250gr fibre. – Base, option to choose the swivel base in stainless steel, ash wood, epoxi lacquered metal.